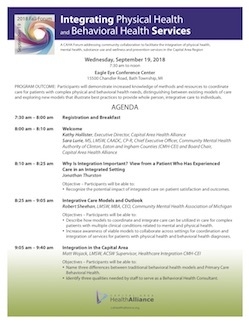 On September 19, 2018, over 122 clinical and administrative professionals and community members attended Integrating Physical Health and Behavioral Health Services, a CAHA Forum addressing community collaboration to facilitate the integration of physical health, mental health, substance use and wellness and prevention services in the Capital Area region. 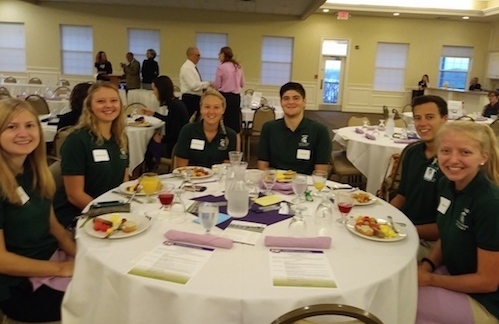 The program was open to all members of the community, and attendees included clinical and administrative professionals in the Capital Area Region working for health clinics, health systems, long term care facilities, social services agencies, public health agencies, primary care and specialty medical groups, payers, employers and school based clinics. Continuing Education credits were available. 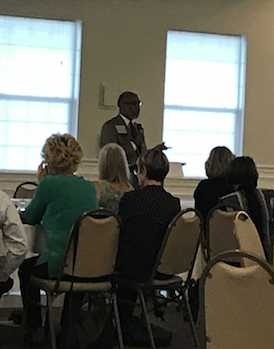 The forum featured presentations on integration models in other states, integration efforts underway in Michigan, and existing, viable models to integrate physical health and behavioral health services in the Capital Area. Two panels explored the provider experience with integration models in the region and the ways in which health systems and organizations can work toward providing integrative care to individuals with complex needs. As part of the forum, participants were asked what we can do as a community to facilitate integrated care that cannot be done by individual organizations. These ideas will be used to identify opportunities for future collaborative efforts. For a detailed forum summary, click here.